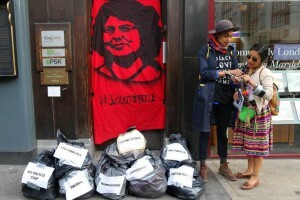 Last week, campaigners in London and around the world marked the assassination last month of Berta Cáceres, the prominent Honduran human rights campaigner. Natalie Jeffers, Imani Roinson and Wretched of the Earth pay homage to Berta's living legacy. 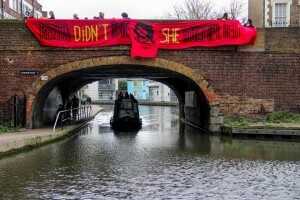 Last week, on April 3rd 2016, The Wretched of the Earth, Matters of the Earth and other UK activists marched along London’s Regent’s Canal, holding aloft a 10-metre banner that read “Berta Didn’t Die. She Multiplied”. We walked from King’s Cross to Baker Street – cleaning the canals as we marched on to the Honduran Embassy – marking one month since the assassination of Berta Cáceres. 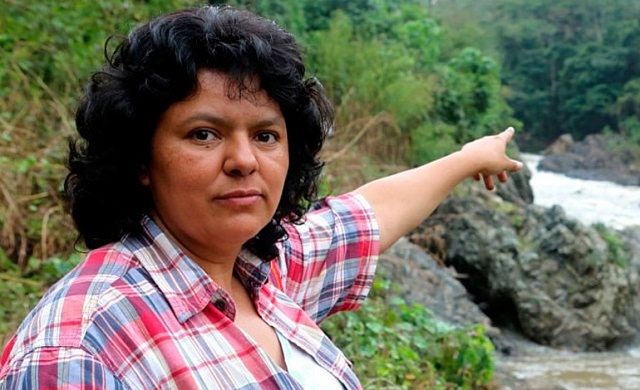 At around 1am on March 3rd, Berta Cáceres, the co-founder of the Civic Council of Indigenous Peoples of Honduras (COPINH), was shot dead by Honduran government-backed death squads who entered her home in La Esperanza, Honduras. Her assassins escaped, but not before wounding Mexican activist Gustavo Castro Soto, who was staying with her that evening as increasing threats were made against her and her children (already living in exile outside of Honduras). Gustavo was shot twice and feigned death. Berta died in his arms. 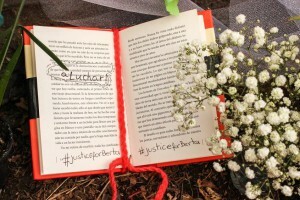 Berta’s murder does not stand alone. Less than two weeks after her death, Nelson Garcia, another member of COPINH was also assassinated. Environmental activists in this region have long been systematically and tragically targeted; human rights defenders across the globe have lost their lives fighting for justice, defending their indigenous lands, homes, communities and natural environment from the destructive forces of racialised capitalism, privatisation and extractivism. Back in 2009, the Inter-American Commission on Human Rights made it clear to the Honduran government that Berta Cáceres was facing serious threats and danger to her life and launched official requests for her to be protected. But the Honduran government did not fulfil their responsibility, despite the repeated death threats against her. In fact, they looked in the opposite direction and are consequently largely culpable for her murder. In light of this, there are mounting cries from the international community calling for the government of Honduras to be held accountable for their actions – or lack thereof – and to ensure true justice is achieved for Berta’s family and for the Lenca community. In her eulogy, Beverly Bell writes that “Berta’s belief in participatory democracy extended profoundly to her everyday practice and she always made herself accountable to the communities she worked for”. Bell recalls an anti-oppression training session led by Berta, where she asked participants to examine whether they were Caesars or artisans. Were their practices – not just their statements – aligned with the oppressors or with the oppressed? Were they promoting the grassroots or simply themselves as leaders? In light of such considered self-critique and intentional accountability, we gathered to show Berta’s family and the Lenca community that they are not fighting for #JusticeForBerta alone. Berta gave a rallying call for us all to hear: we must ‘Think Local and Act Global’. We must love and support each other in our struggles against oppression. It is vital that as human rights activists in the Global North we show up as allies for COPINH and all women human rights defenders in Honduras and across the world. Showing up as allies means holding our actions accountable to the needs of the local and understanding our relative positionality. Berta spent her life thinking locally and acting globally. She spent most of her days doing whatever was needed to support the Lenca tribe, co-founding and organising for COPINH, as well as building a continent-wide boycott of the World Bank and Inter-American Development Bank, and building long-term relationships with many international organisations. At the time of her murder, Berta was becoming more influential on a global scale. She was a voice for her people, for the Lenca community; a voice that consistently amplified collective truth to power. This voice has not been silenced in her assassination. It has, in fact, been amplified and multiplied. Silence is and always will be complicity. And when Global North activists speak out, we must speak from a place of relative privilege and not speak on behalf of ‘The Subaltern’. We can recognise the ways in which #WeAreAllBerta, but we must not lose sight of the fact that some of us must also be allies. We have a responsibility as environmental activists in the Global North to do our research and to hold a global network of neocolonial, extractivist capitalists accountable. This means lobbying our own governments as well as the Honduran embassy. It means calling out our banks for continued investment in these projects. A global and grassroots solidarity network must be committed to protecting our environment and refusing to stay silent. It is our responsibility to recognise our complicity as well as our outrage. Last month, at the Commission on the Status of Women, Bertha Zuñiga Cáceres, Berta’s daughter, was accompanied by JASS:Just Associates and Matters of the Earth to the United Nations Headquarters in New York. Together with Bertha, Lenca tribal leaders and partners of COPINH, had been applying pressure on the Dutch and Norwegian governments to withdraw investment from the Agua Zarca hydroelectric dam which will destroy Lenca Territory on the sacred Gualcarque River in Rio Blanco, Honduras. The Lenca people alone are facing the prospect of 17 dams being imposed within their territories. The Dutch Development Bank, FMO, has since said it would suspend all activities in Honduras in light of the murders of Berta Cáceres and Nelson Garcia. In 2014, 829 hydroelectric projects were approved in South America, with a total investment of $22 billion. The US Government – which has been linked to the attempted destruction of a vast number of social movements in Honduras – is also being asked to respond to the enormous leverage it has in Honduras through its assistance programmes and veto power over multilateral loans. Immediately request a technical assistance agreement between the Honduran State and the Inter-American Commission on Human Rights for an independent commission of experts, trusted by COPINH and Cáceres’ family, to supervise, support, and participate in the murder investigation currently conducted by the Public Prosecutor. Immediately and irrevocably cancel the concession given to the DESA Company for the “Agua Zarca” hydroelectric dam project, on the grounds that they have been the primary source of threats, persecution, and violence against the Lenca community of Río Blanco and members of COPINH. This project represents a permanent threat to our security. Immediately suspend all concessions granted within Lenca territory without the free, prior, and informed consent (FPIC) of indigenous peoples, setting into motion a review process toward the cancellation of the concessions. Demilitarize all areas and territories of the Lenca people, and respect the geographic autonomy and forms of self-governance of Lenca communities, designating COPINH as the organization responsible for its community autonomy. End persecution and criminalization of COPINH and all human rights defenders in Honduras. Berta lived and died defending the most basic source of life – water. In countries like the UK, we often take this essential resource – as well as the right to stand up for our rights, for granted, while Indigenous communities and people in the Global South continue to be murdered over such basic fundamentals. The fact that the project that Berta died fighting – the Agua Zarca dam – was being forced ahead by multinational companies and banks in the Global North, adds a deeply unsettling colonial stain to her already tragic assassination. 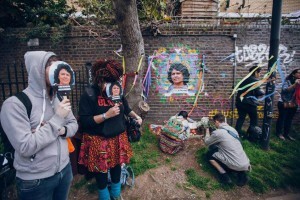 We took to London’s canal to both commemorate the life of an inspiring woman, cut down before her time, but to bring home the issues she gave her life fighting for, as well as our own complicity in them. We must demand accountability from the companies and governments in the Global North that have enabled the on-going neo-colonial destruction of life, far from their bases of power. Honouring Berta’s life, it is our responsibility to continue the ‘struggle against capitalist, patriarchal and racist powers’ and the construction of alternatives to CO2lonialism. The Wretched of the Earth and Matters of the Earth, in solidarity with Berta Cáceres family, COPINH and its partners, are now calling on the British Government to issue a statement in support of COPINH’s demands and to take action by withdrawing any support for activities in Honduras that may impact the human rights and livelihoods of indigenous peoples’ and the Lenca community. Berta did not die; she multiplied. Long may she live, in the hearts, minds, passions, and actions of all of us. May all women and men commit themselves to realizing the vision of transformation, dignity, and justice for which Berta lived, and for which she died. Outrage is not enough, we in the Global North, European Union and United Kingdom need to apply pressure on our governments to take action NOW! Natalie Jeffers is Founder/Director of Matters of the Earth and an education & engagement specialist, organiser and activist. Imani Robinson is an activist, critical thinker and organiser of British, Caribbean & African-American descent.